Net sales increased by 5% to SEK 67,561m (64,184). Organic sales, which exclude exchange rate effects, acquisitions and divestments, increased by 3%, of which price/mix accounted for 1% and volume for 2%. The acquisition of Wausau Paper Corp. increased net sales by 5%. Organic sales decreased by 1% in mature markets and increased by 10% in emerging markets. 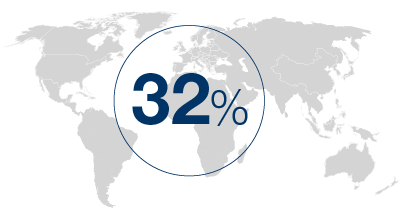 Emerging markets accounted for 32% of net sales. Exchange rate effects decreased net sales by 3%. For consumer tissue, organic sales increased by 3%. Growth is related to high growth in emerging markets, particularly China, Latin America and Russia. For AfH tissue, organic sales increased by 3%. The increase was related to Western Europe and emerging markets. 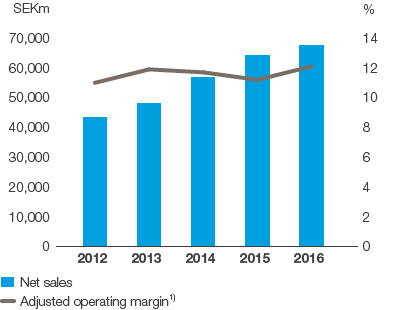 The adjusted operating profit1) rose 13% (12% excluding currency translation effects and acquisitions) to SEK 8,155m (7,217). A better price/mix, higher volumes, cost savings, lower raw material and energy costs, and acquisitions contributed to the earnings increase. The acquisition of Wausau Paper Corp. increased operating profit by 4%. Selling costs were higher, and investments were made in increased marketing activities. The British pound and Mexican peso have weakened against several trading currencies, which had a negative earnings effect. The adjusted operating margin1) amounted to 12.1% (11.2). The adjusted return on capital employed1) was 13.5% (12.9). 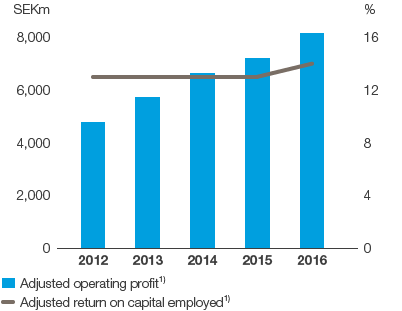 The operating cash surplus amounted to SEK 11,970m (10,703). Operating cash flow amounted to SEK 9,334m (7,667). Capital expenditures amounted to SEK 4,101m (3,536). SCA’s sales to retailers’ brands as a proportion of total consumer tissue sales was 36%. of the business area’s net sales in 2016. In emerging markets, organic sales increased by 10% in 2016.